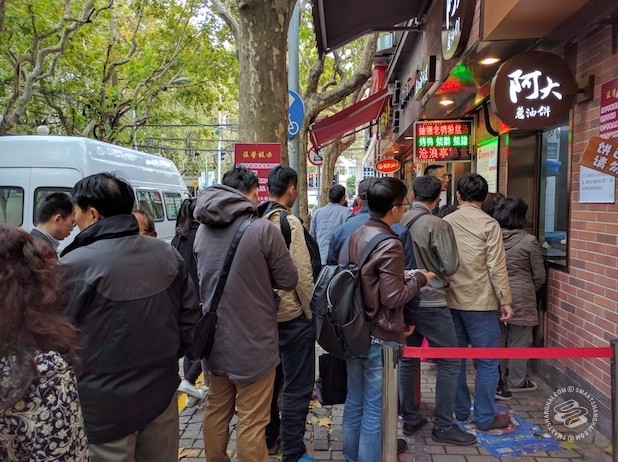 SmSh lines up (kinda) for the latest sensation to hit Shanghai's street food scene. A pancakes story 30 years in the making. In "Back of the Queue", SmSh sends our writers to some of the city's worst lines to see what's up with them. "What are they selling? Is it worth the wait? Let's send some poor unfortunate soul to find out." That's our thinking with this. The venue: Ada Scallion Pancake. 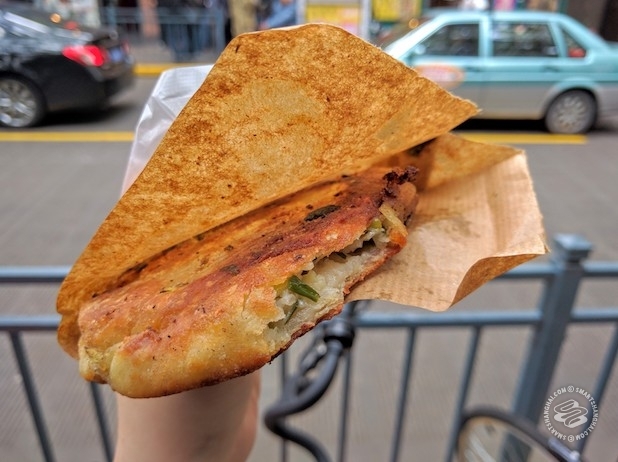 The item: Scallion pancake (cong you bing, 葱油饼), a Shanghainese traditional street food that is pork fat and scallions inside folded dough. Normally costs around 3.5rmb. The wait: You'll need to queue up before 6am to get a number (which is written directly on your hand -- no funny business). That's limited to 50 people only. The waiting time is around 2 to 3 hours if you don't have one. We waited for a brisk 45 minutes; you'll find out why later. 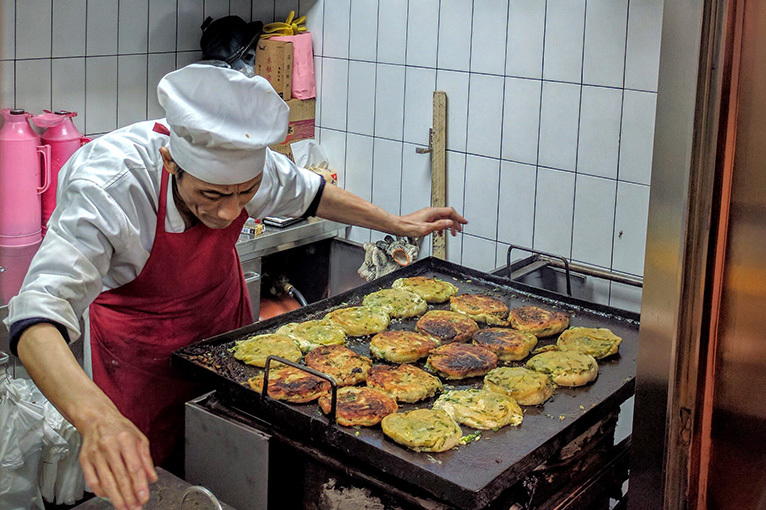 A little background info: Mr. Wu (AKA "Ada") has been making scallion pancakes on Maoming Nan Lu for over three decades. 30 years. Three. Zero. 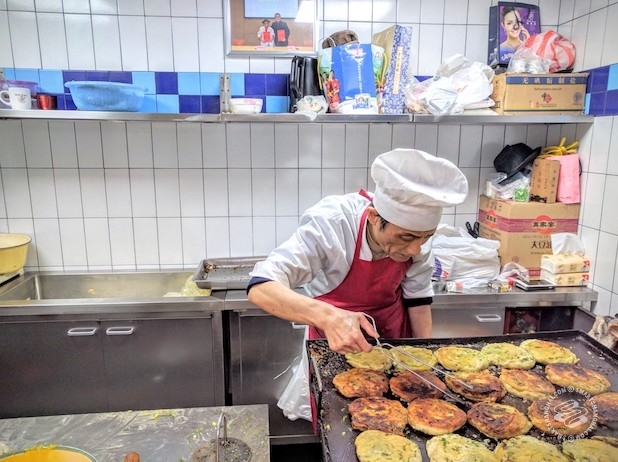 Despite the physical discomfort he experiences due to a childhood deformation, he still gets up at the crack of dawn to prepare and pan fry these pancakes, single-handedly, which are priced at 5rmb each. After he's done the cooking, his shop opens at 10am daily. Except Wednesdays. Wednesdays was and are his weekend. The dedication! What a story. Ada has attracted the attentions of local food bloggers, with his maximum hype level resulting in a BBC documentary: Rick Stein's Taste of Shanghai. 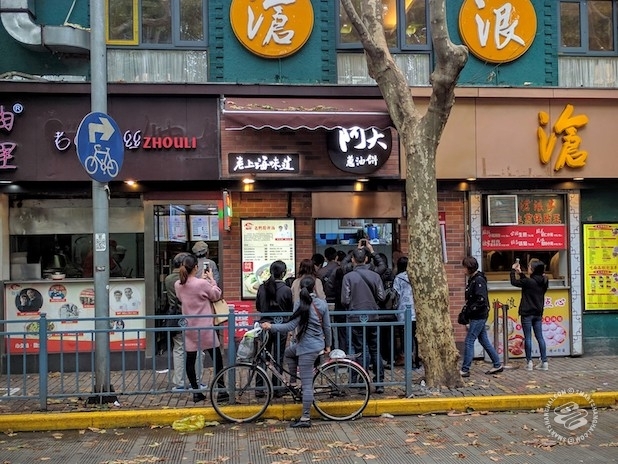 However... the increase in exposure actually led to the closure of his food stand on Maoming Nan Lu, as it was discovered that he was operating without a license and was a long-time nuisance in the eyes of his neighbors. The store was shut down completely in late September of this year. 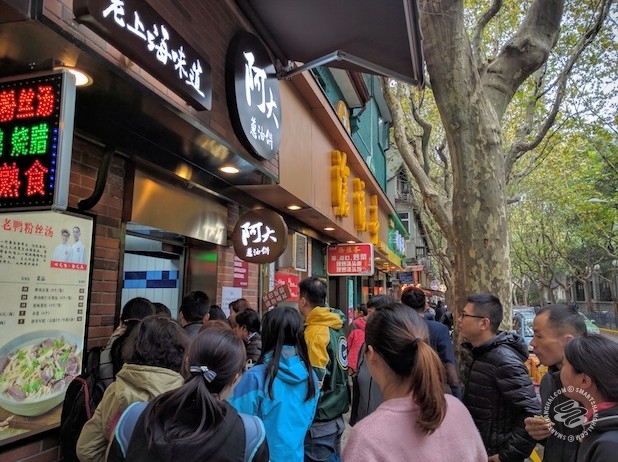 Online food delivery platform Ele.me -- China's largest -- turned their attention to his plight and invested in Mr. Gu's business, helping him to reopened a shop on Ruijin Er Lu at Yongjia Lu. In just a couple of weeks, his license was renewed (and hygiene of his shop slightly improved) and now his 10,000rmb+ monthly rent is also taken care of. This past October 28 was the opening day, with all the pancakes given out for free. Ever since then, Ada's Scallion Pancake has become so popular that scalpers charge 50rmb for one. The line doesn't look crazy, but every 20 or 30 minutes or so, only 10 pancakes are produced from his tiny shop, so it takes a while to get one. Each person can purchase at most five, two if you don't have a number. We arrived at 9:30am, and the sign already says "pancakes are sold out, please don't line up if you don't have a number." The number holders stood closely and eagerly stared at the scallion pancakes. Some had been waiting as long as five hours. People walking by pushed and squeezed through to get a look at what the commotion was about. The numbers system left quite a few hungry. A girl cried, almost begging: "Can you just let me have a bite? I've already come here so many times and I really want to know what it tastes like!" Many people who got the numbers refused to sell: "no matter how much you offer", said one man, "after waiting for so long, do you think I would care about the money?". SmSh managed to get one from an old lady for ten times the price. She was number 23 -- then we were number 23 -- after waiting for half an hour. As a Shanghainese, I have to say it's basically a thicker version of what I've had before many, many times. It tasted savory and greasy, but not unlike others you can get around the city in 30 seconds. The scallion is generous but spread unevenly on the dough. So was the salt. Aside from the crispy skin (also darker and a therefor a bit of a disappointment), there's really not much that stood out about this scallion pancake. I wouldn't consider spending 5rmb to buy such a heavy, obviously not-very-healthy food, let alone queue up for it. Although, then again, sometimes these things are about the journey and not the destination -- which might take 30 years or even two and a half hours waiting in a line. Ada's Scallion Pancake is at 181 Ruijin Er Lu, near Yongjia Lu. Good grief! What an butthead. OBVIOUSLY these are good! I had two tonight. "The scallion is generous but spread unevenly on the dough. So was the salt. Aside from the crispy skin (also darker and a therefor a bit of a disappointment), there's really not much that stood out about this scallion pancake." Nothing is further from the truth as far as I'm concerned.